EUGENE, Oregon -- It seemed only fitting that one of the most unlikely playoff teams in Minor League Baseball swept a Championship Series in the most peculiar way. But the Class A Short Season Eugene Emeralds, or the "Bad News Ems," as they like to refer to themselves, wouldn't have it any other way. Indians reliever Emmanuel Clase was called for a balk with the bases loaded during a tie game in the bottom of the ninth inning as Eugene topped Spokane, 3-2, on Tuesday at PK Park to complete the three-game sweep. It marked the Emeralds' second championship in three years. "We knew going into this thing, we made the playoffs, but why not win it?" Eugene reliever Sean Barry said. "We knew we were last place in the league going into it, but we had nothing to lose and just said, 'Let's go have a blast.' We played with a lot of freedom and we had a blast." Jonathan Sierra led off the ninth with an infield single up the middle and Fernando Kelli followed with a one-out base hit to left. Pinch-hitter Yonathan Perlaza grounded into a forceout at second base, but Clase's next pitch plunked pinch-hitter Jake Slaughter in the back. Andy Weber watched two balls out of the strike zone sail past him pressed with a 2-2 count to bring in Sierra with the tying run. Clase stumbled out of his windup and spiked his first pitch to Nelson Velazquez in the dirt and home plate umpire Ray Patchen signaled for a balk, plating Perlaza for the crown. "We hung in that game, like we have all year," Emeralds manager Steve Lerud said. "We were in a lot of games, and this last month, it's really turned around for us, and this is what happens. ... I don't care how it happened, but this is how it happened. You talk about player development? This last month here, I'd say we're probably the best team in this league." The self-attributed moniker of "The Bad New Ems" was born while popping champagne at Ron Tonkin Field after sweeping the best-of-3 semifinals against Hillsboro, which won the first-and second-half South Division titles after leading the league with a 51-25 record. Conversely, Eugene finished the season with the lowest mark at 31-45, but nabbed the Wild Card with a 17-21 record in the second half. Barry's roommate, Casey Ryan, mentioned Eugene was like The Bad News Bears after ousting the circuit's best regular-season team. The right-handed Cubs prospect relayed that to Emeralds general manager Allan Benavides, who began using it on social media. Eugene went 5-0 in the playoffs, taking four of those five games by a score of 3-2. 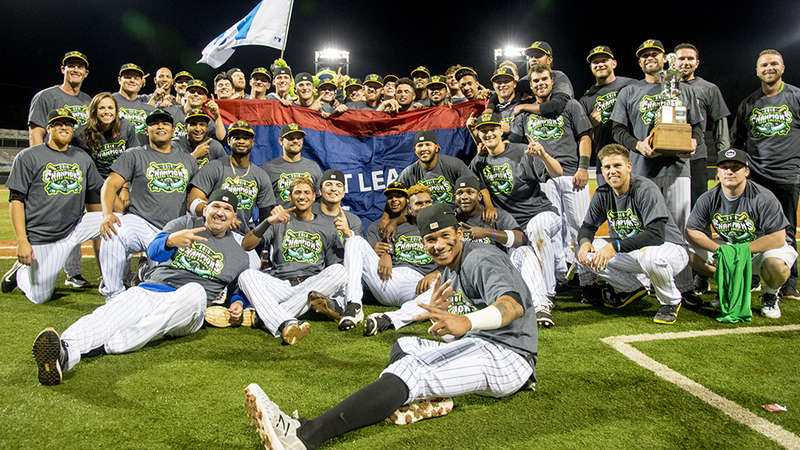 The Emeralds' .408 regular-season winning percentage was the lowest to result in a championship in Northwest League history, according to Eugene. "It sums it up well," Emeralds catcher Caleb Knight said. "This is my first season in pro ball and I've seen some crazy things, but this team battled from the beginning. And eventually, it was going to turn into some wins." A major component of the playoff run proved to be the bullpen, which didn't relinquish a run over 25 innings in all five of Eugene's postseason wins. "The bullpen's been awesome. They've been unbelievable," Lerud said. "They delivered game after game over the last three weeks here and kept us in that game right there." Peyton Remy delivered scoreless innings of relief for the Emeralds on Tuesday. Fauris Guerrero walked Starling Joseph and Jax Biggers in the top of the ninth, then Ethan Roberts loaded the bases with two outs by walking Curtis Terry, but forced Diosbel Arias to fly out to squelch the threat. Eugene plated the first run of the ballgame after Velazquez doubled with one out. Spokane shortstop Jax Biggers committed a fielding error and Velazquez hustled all the way from second to score on the play. Spokane responded in the second when Sherten Apostel plated Diosbel Arias with an RBI single. Apostel then broke the 1-1 tie with a mammoth solo homer to center in the fourth off Emeralds starter Eury Ramos, who was tagged with both of the Indians' runs on four hits over four innings. Spokane starter John King gave up one unearned run on three hits over five innings. Cole Uvila pitched 2 1/3 innings of hitless ball, fanning four and walking three.